Independence is the fourth largest city in the state of Missouri. It has a population of around 120,000 residents. Independence is the county seat of Jackson County, but a small part of the city lies in Clay county. Near the western edge of the state, Independence lies on the south bank of the Missouri River. 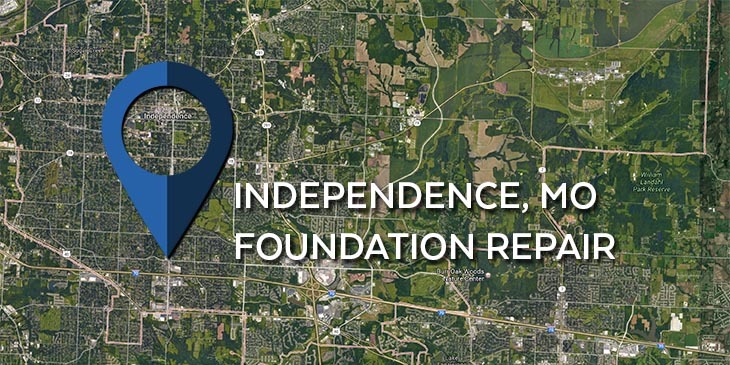 KC Pro proudly does foundation repair Independence MO and the surrounding areas to ensure a safe living environment. Independence is noted as the hometown of President Harry S. Truman and is also known as the “Queen City of the Trails.” It was nicknamed that because it was a point of departure of the California, Oregon, and Santa Fe trails. This city played an important role in the Latter Day Saint movement and is home to the international headquarters of several Latter Day Saint denominations. If you notice that your home is starting to have foundation problems such as cracks, leaning walls or chimneys, or sinking foundation, then KC Pro can solve your foundation issues. For foundation repair in Independence, MO, KC Pro fixes your home so it is safe and sound. Soil-related disturbances tend to be a large factor when needing foundation repair. Poor compaction, overloading, and excessive materials that expand and shrink with the changes in the moisture content greatly impact the amount of stress on your home’s foundation. This stress can be reduced through use of helical and steel piers and a process called underpinning. KC Pro has several foundation repair systems to overcome the damage already done. At KC Pro, we are a full foundation repair company. Not only do we take care of foundation repairs, but we also cover basement waterproofing issues. Since we are a trusted company, don’t hesitate to have us come and take care of your home’s basement waterproofing problems. We are glad to be of service for you and your family. We want you home to be as safe and sturdy as possible, so don’t hesitate to have us come in and handle waterproofing repairs. We offer so many solutions for the Independence area including: Sump pumps, interior drainage, exterior drainage, sump basins and more. We also offer crawlspace encapsulation and vapor barriers to keep your crawlspace dry. You don’t have to live with a wet basement, we have solutions that you can afford. A wet basement is a hazard for you and your family. So much of the air we breathe comes from our basement and crawlspace. If you have a wet basement or crawlspace you could be breathing mold and mildew. Avoid the health issues associated with breathing unhealthy air, call us today and let us help with your basement waterproofing needs. If you are in need of foundation repair in Independence, MO or in the surrounding areas, then contact us today at KC Pro.